Video surveillance is the use of cameras to transmit a video signal to a monitor and/or video recorder. Uses and applications of video surveillance. Retail Control. Retailers may want to monitor the actions of workers and customers for the purposes of theft prevention and security. Tracking the actions of workers may especially be desirable when they are making financial transactions, such as ringing up products, accepting payments, issuing change, correcting or cancelling a sale, etc. Video surveillance can also be integrated with some point of sale systems to directly display a video text overlay block with subtitles that explains a cashier's actions and allows monitoring the cashier area, associate POS transaction data with videos, record videos for retroactive analysis, and use as evidence for shop lifting and employee theft. Use in Schools. Video surveillance has become an important tool for schools wishing to monitor visitors, track suspicious behavior, and obtain evidence in the event of crime. Cameras are generally installed in hallways, door entrances, parking lots, gymnasiums, cafeterias, and supply rooms. Residential and Multi-tenant Areas. Video surveillance can improve home security by deterring criminals from breaking in or vandalizing homes. In the event of a crime, video evidence can help establish the facts and catch the perpetrators. Property managers commonly keep multi-tenant buildings under surveillance in areas such as hallways, stairways, and courtyard areas to promote safety. Industrial Processes. Areas of dangerous working conditions are often supervised by video surveillance to monitor for safety issues. Crime Prevention. Most areas that are vulnerable to crime can benefit from a video surveillance system. There is strong evidence that video surveillance aids in detection and conviction of offenders. Police routinely seek video surveillance recordings after crimes. All surveillance systems are not equal. There are three major video surveillance technologies in use today: Digital, HD-SDI, and IP-based. The main differences between them are video quality and cost. A digital video surveillance system contains an analog camera that connects to a DVR (Digital Video Recorder) through coaxial cables. The camera transmits a raw analog video signal, which is then transformed into a digital signal by the DVR. 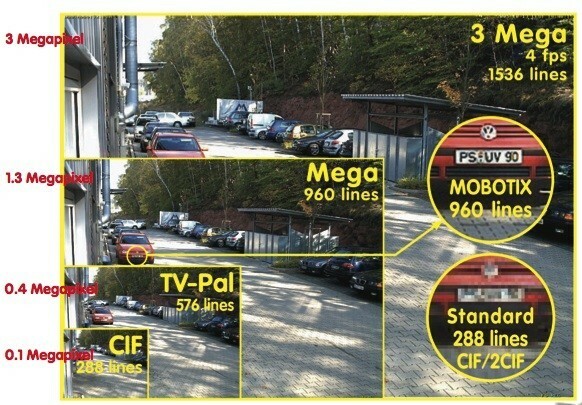 The video resolution of analog cameras is measured in TV Lines (TVL). A higher number of TVL means a camera is able to render video in greater detail. Analog cameras typically vary from 280 TVL up to 600 TVL, which translates to a digital resolution of up to 720x480 pixels or 0.3 megapixels. Digital video surveillance is typically used when a general overview is sufficient and details are not necessary. This is the least-cost solution. A HD-SDI video surveillance system contains an analog high definition (HD) camera that connects to a high definition digital video recorder (HD DVR) through coaxial cables. The HD resolution of HD-SDI cameras varies from 720p (1280 x 720 or 0.9 megapixels) to 1080p (1920 x 1080 or 2.1 megapixels). HD-SDI cameras are a great solution where high quality detail is necessary. Since the cables used for HD-SDI are the same as for a conventional digital video surveillance system, it can be a very cost effective solution when an existing cable infrastructure is already in place. An IP video surveillance system contains an IP camera that connects to a network video recorder (NVR) through a network connection, which is typically achieved with a cat5e cable. The resolution of IP cameras typically ranges from 1.3 to 5.0 megapixels or more. Multi-megapixel resolution allows greater detail to be captured, such as license plates and facial recognition. IP cameras typically cost the highest and are used in places where detail is of the utmost importance. Customized Solutions. There is no "one size fits all" solution in video surveillance. Every business is unique, so we offer custom solutions from the latest in video surveillance technology for your specific business requirements. Professional Installations. A proper installation is essential to sustain a reliable, working system in indoor and harsh outdoor settings. We perform full service and installations of video surveillance in Chicago and the surrounding suburbs and cities throughout Illinois, northwest Indiana, and southeast Wisconsin. Service & Support. The Tigerbyte promise is to keep our customers happy. When there's a problem, we fix it by providing same day problem diagnosis and resolution through remote access, phone support, and on-site tech support. Warranty. We provide a full year warranty to keep you running with peace of mind. Call us today and discover what we have to offer with a free on-site consultation and product demonstrations.